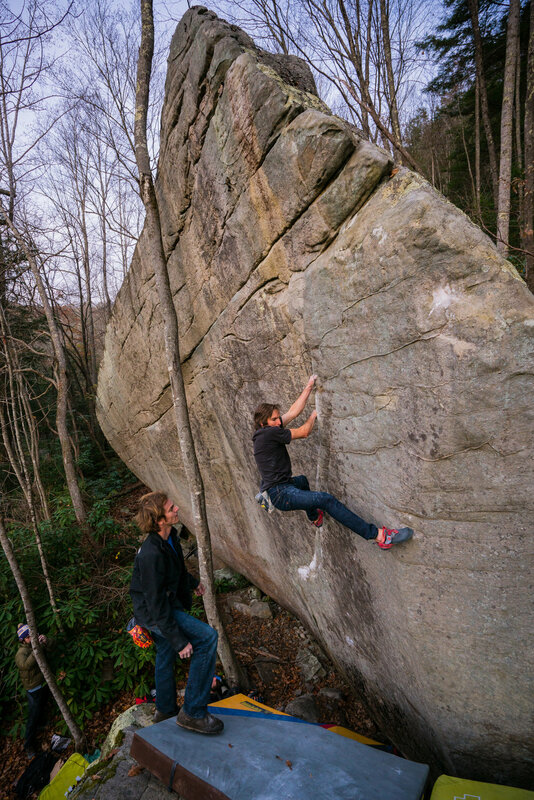 The New River Bounty was a unique idea for a climbing competition: cash prizes (“bounties”) were offered for first ascents of unclimbed boulders in the New River Gorge. 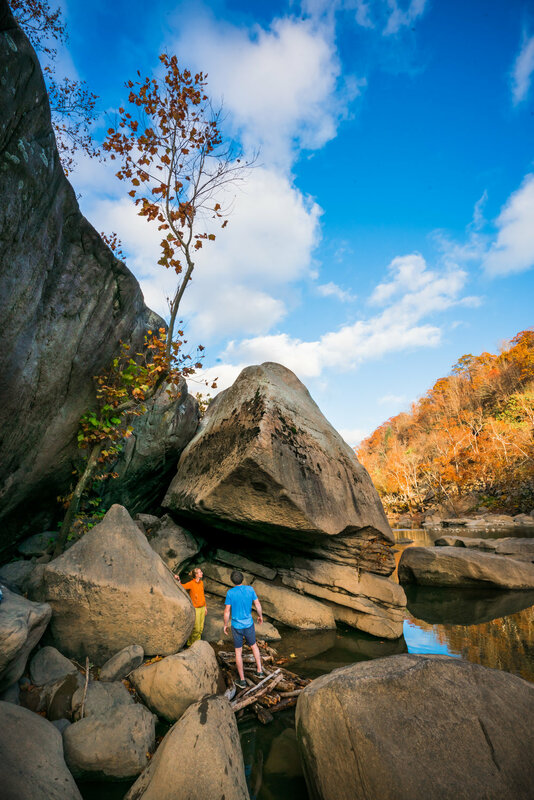 Local businesses, climbing gyms, and climbing equipment companies banded together to put cash incentives on a list of problems curated and prepared by members of NRAC (The New River Alliance of Climbers). 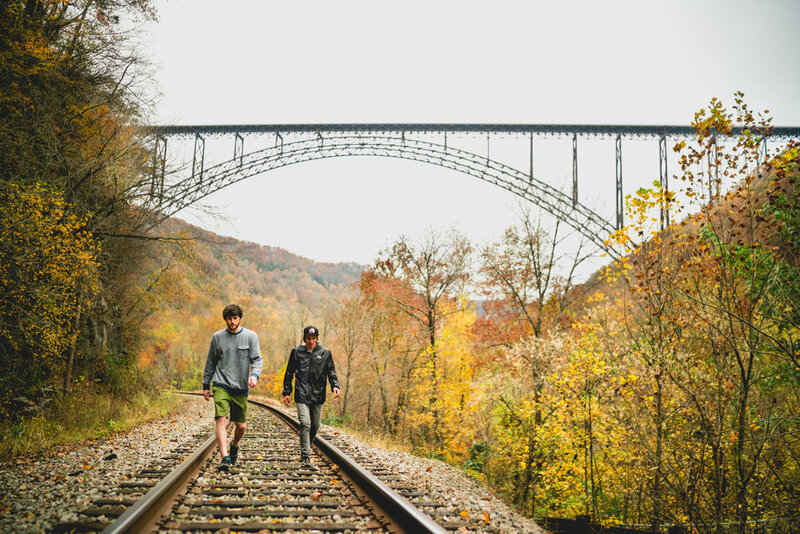 Climbers local to the New River Gorge had spoken at length about the potential for hard bouldering in the area, but before the New River Bounty took place, there wasn’t much to speak of with regard to hard, world class problems. There were merely hard, world class projects. Climbs that seemed extremely improbable, if not downright impossible, or at least unreasonably scary. The New River Bounty competition - and particularly Jimmy Webb’s contributions during the event - helped change that notion. 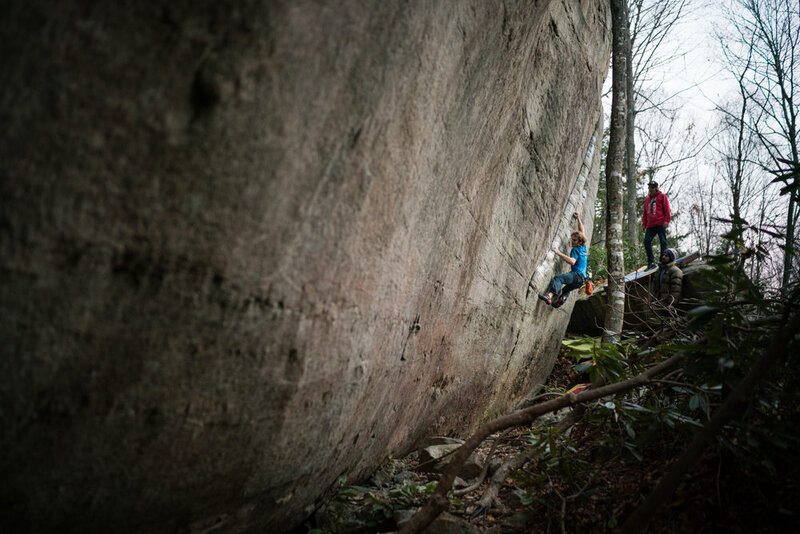 Make no mistake, the boulders in West Virginia are some of the best in the world. Basic, ugly scenery and a basic ugly boulder. Just kidding. 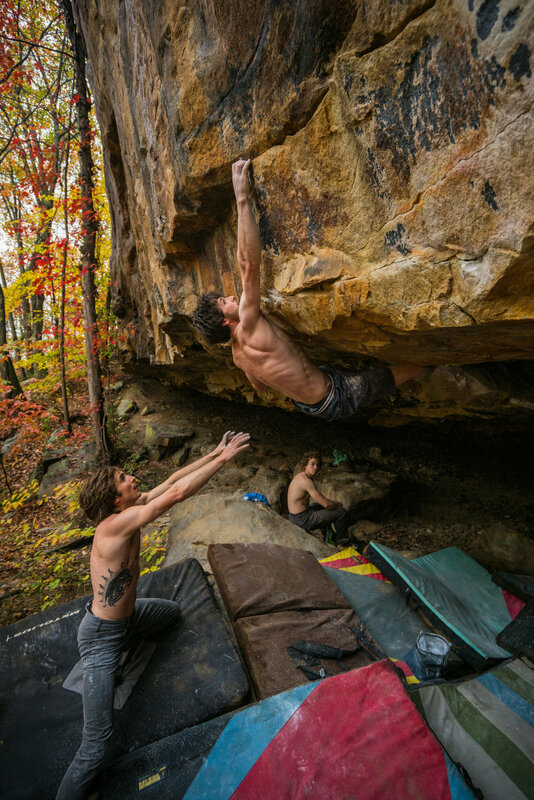 Daniel Woods gunning after the second ascent of Get Rich or Die Tryin’ (V11). The sandstone scattered in the creeks and hillsides near Fayetteville, West Virginia is some of the finest stone I have ever seen. The Endless Wall is one of the best singular cliffs in the United States, made up of a quartz-rich sandstone that forms in improbably perfect breaks, cracks, scoops, and acute arêtes. 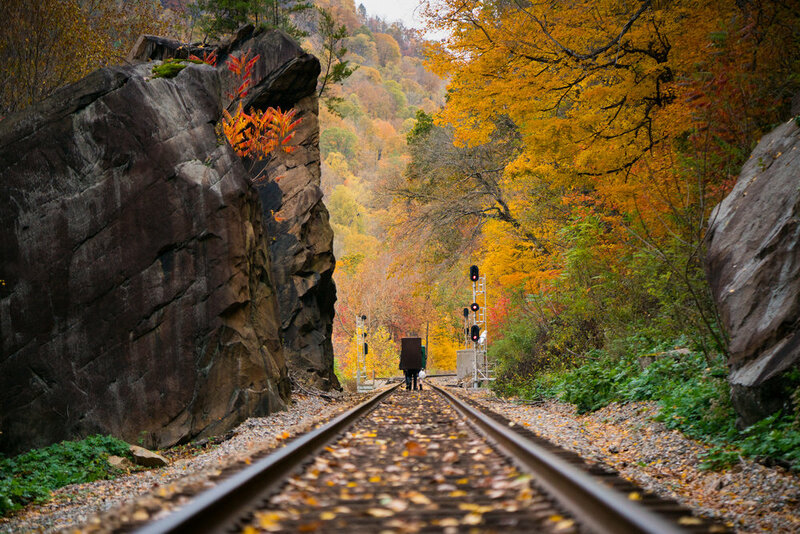 But the cliffs that ring the rim of the New River Gorge have also spawned some of the best boulders in the world. Monstrous chunks of bomber sandstone cleaved off the sheer walls, and careened to the bottom of the gorge. 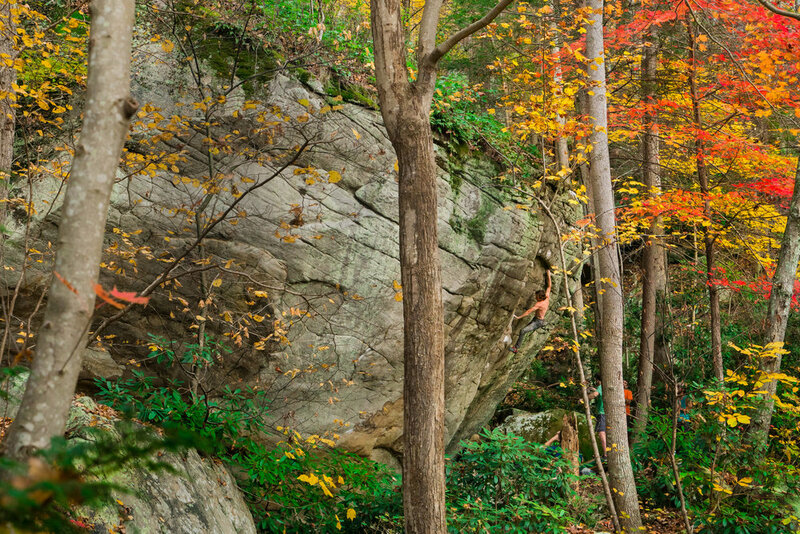 Colossal boulders litter the area’s creek beds and tributaries with perfectly formed lumps of stone, shrouded for years and held secret by dense, jungle-like forests of beech, chestnut, oak and rhododendrons. 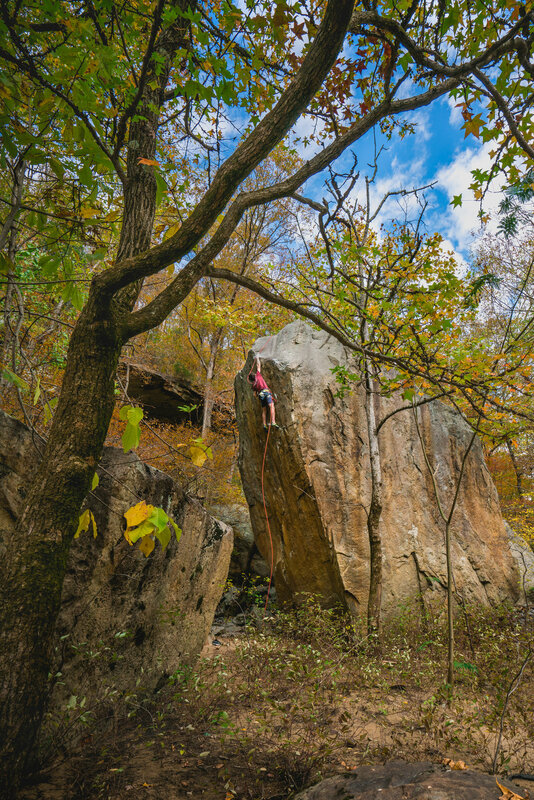 Climbers that nested in Fayetteville soon discovered that for all of the route climbing potential held in the Gorge, there was an equal amount of potential for hard bouldering. 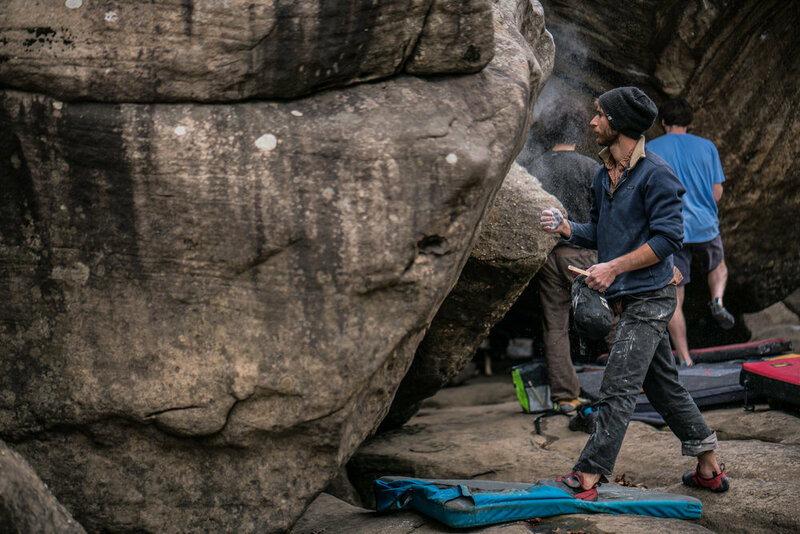 Most climbers that discover a trove of giant boulders - improbably overhanging on all sides and littered with perfectly sculpted features and grips - could be forgiven for trying to keep such a special area as a secret. 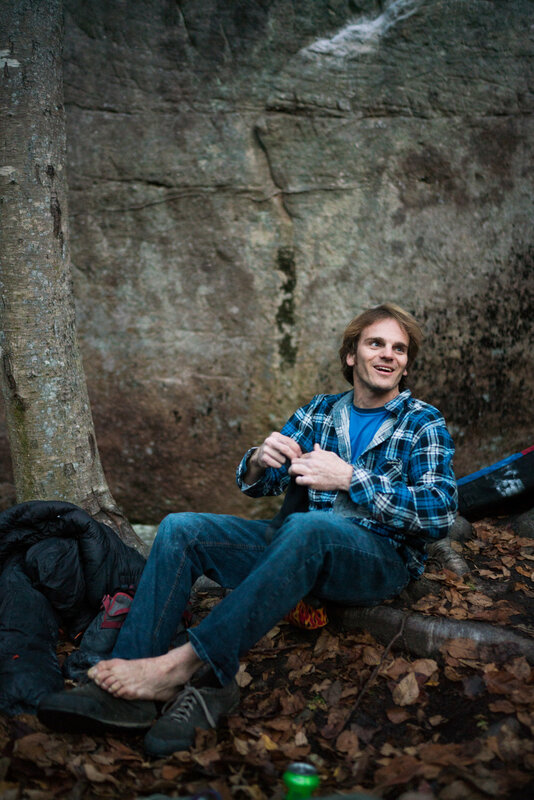 But in the spirit of the Southern climber (and perhaps as a solution to a uniquely Southern problem), members of the NRAC decided that it would be best to open their area to the world, and to invite and incentivize professional climbers (and professional vagrants alike) to sample their hardest projects. Try it out, let us know what you think, come and have yourself a play on these here boulders and stay for the month why don’t you. The NRAC even rented a house out for the athletes (thanks so much Pat&Jess!!!). The only problem was, nobody seemed to pick up the invitation. 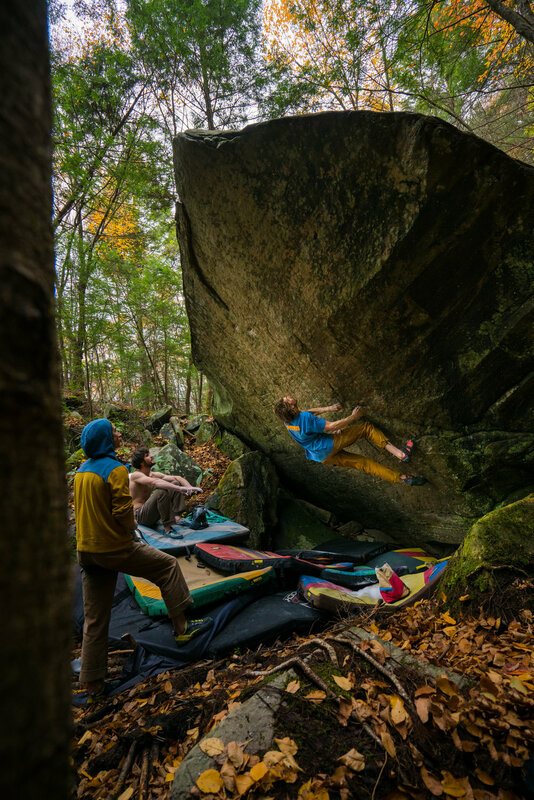 The beast unleashed: Jimmy Webb managed to claim five of the eight first ascents during his nine-day trip to the New. Nobody, except for Jimmy Webb, that is. As a long-time resident of the Southeast, Jimmy knew that there was vast potential in the New. 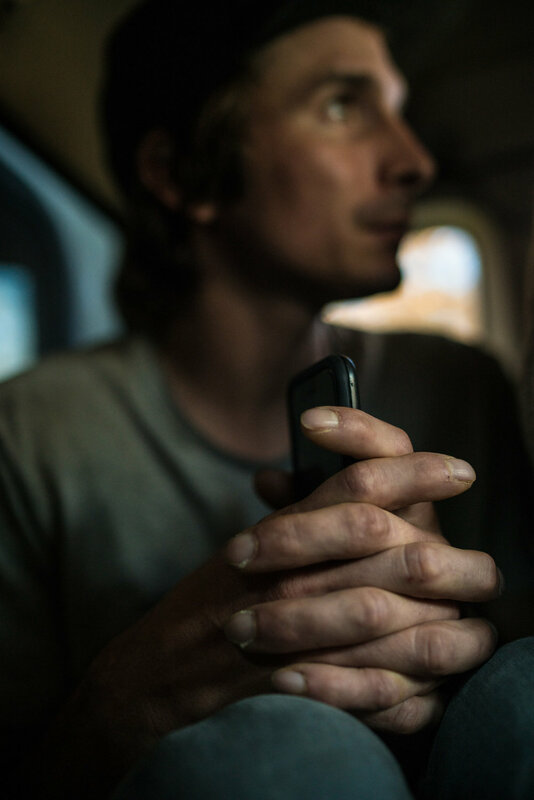 But even when he lived in the South, Jimmy rarely ventured far from his home fields near Chattanooga, and a recent move to California made West Virginia seem like an even further-flung option for first ascents. But the lure of a $8000+ cash purse was enough to change old JimmyBobby’s mind, and so a ticket was booked, and on November 1st, Jimmy was first in line to register for the comp. What ensued was a pretty standard display of what you’d expect to see if you let a monkey loose in a banana stand. Jimmy snapped up five first ascents in nine days - at one point sending two projects during what was supposed to be a rest day. The only factor that could deter his rampage was the weather, which forced a total of four days of rest while we were in West (Wet) Virgnia. All those sculpted features have to be sculpted by something, and in the case of the New, that sculpting factor is the rain. Jimmy had planned to stay for at least two weeks, if not longer, but with $5000 in winnings and a dismal-looking 10-day forecast, he took the money and ran on home. One of the only reasonable projects left undone by Jimmy. A few weeks later, James Pearson made the first ascent of this terrifying obelisk of sandstone. Good on you, you absolute nutter. On a personal note - if you’re still reading this, and you watch the above video all the way through - thank you. It’s a hell of a lot of work putting all of this stuff together. I would say that if I counted the hours I spent filming and shooting these photos, I’m close to 300 hours deep into this particular project. Normally, I would ask for a personal donation to make this effort worth it (as in I would charge for this video), but in the case of the New River Bounty - even after any and all companies backed out of paying for video content of the event - I still felt a duty to edit and release this video. It was just such a unique event, and I hope that it doesn’t have to be the last New River Bounty. So if you liked this video, or think this comp is a cool idea, please donate to the New River Alliance of Climbers (NRAC). They put on this event, and they also secure access for these climbing areas and help maintain them. And now for a few pictures (it was damn hard to snap pics and take video, but I did my best).